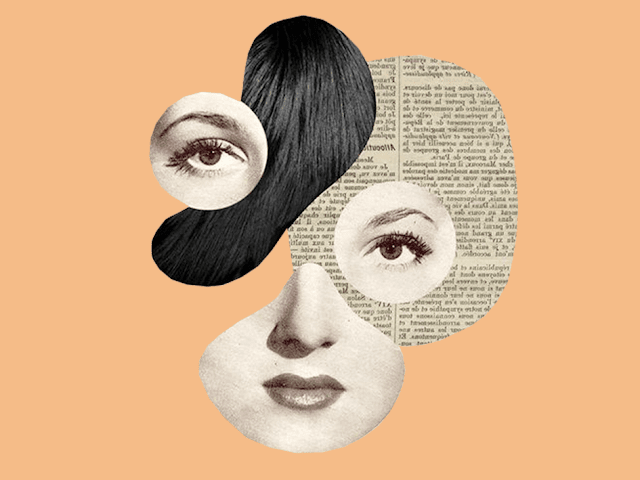 (Originally written as a foray into art journalism for the Young Art Journalism Awards; this piece has been published on their website here). There is a house in Taipei which is standing on its head. Upon first setting eyes on the upside-down dwelling, one could be forgiven for thinking that Taiwan’s notoriously strong Kaoliang liquor has finally taken hold – and if not on you, then certainly on the construction workers. Yet the topsy-turvy effect of Huashan Creative Park’s most eye-catching attraction is both deliberate and well-executed. 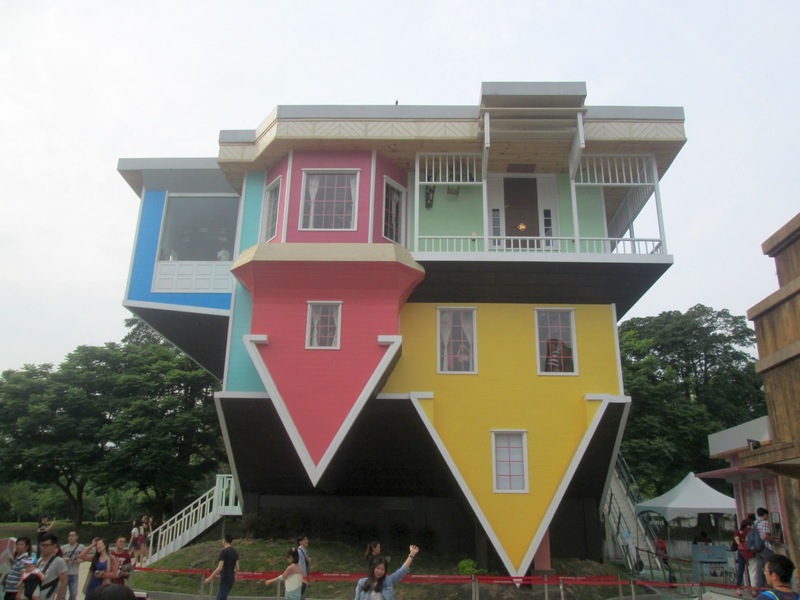 The fully-furnished, 300-square-metre multi-storey house was built as part of the Upside Down Wonderland Exhibition organised by the National Taiwan Science Education Centre. Construction took a mere two months to complete; and, since the house’s opening on the 6th of February 2016, tourists have flocked in their thousands to walk on its ceilings every day. It’s not hard to spot the appeal. Aside from this potentially being one’s only chance to ever walk safely underneath an upside-down toilet, a heavily-loaded dining table, and various other flipped household features, there is also a car nailed to the ceiling – or floor, as it is technically supposed to be. How it got there remains a mystery; however, nothing untoward (or weighing two tonnes) has befallen any visitor just yet, so it appears to have staying power. 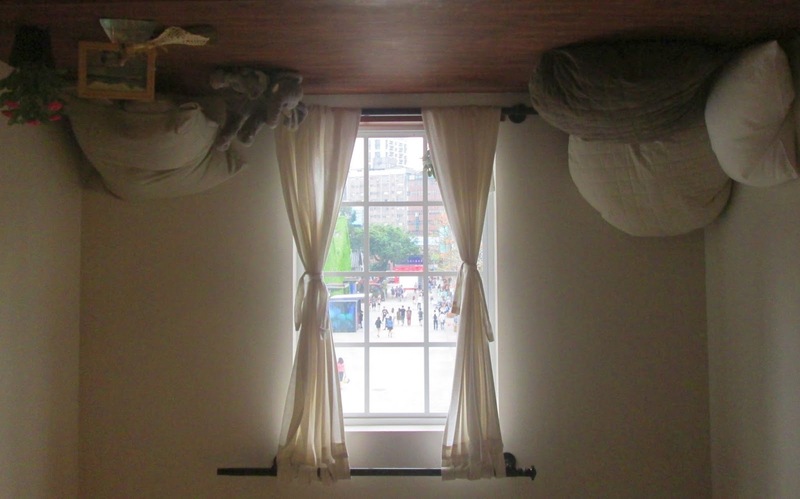 Hello from the inside of Taipei’s upside-down house. The house has proved popular, and visitors on weekends can expect to wait for over two hours before being allowed to enter. Nevertheless, this is the only real down-side: tickets, which can be bought on site, are inexpensive – 199 NTD is a mere AUD$8 – and visitors can explore the house’s ten rooms at their leisure, generally receiving about 40 minutes to make their way through the whole building. Furthermore, aside from staff members being posted in every few rooms to usher along anybody who looks too confused, the exhibit is a remarkably un-regulated experience: guests are welcome to touch the furniture (for the record, the fridge opens), and creative posing for cameras is not merely tolerated, but shamelessly embraced by everybody. ‘The author poses with a towel’ – not a phrase one typically expects to publish online. The exhibition’s success is undeniably owed to its interactive nature, at least in part. It also stands out – and is rendered more fun – by the fact that visitors are granted autonomy in their exploration of the house. There’s a certain level of trust here: staff members smile at visitors instead of eyeing them suspiciously, and nobody snaps at you not to mess about with the IKEA furnishings. Exhibits like this can cause one to wonder what art exhibitions in the future may hold. To be able to walk around inside of the artwork and physically interact with it is fun in its novelty, and arguably more memorable than solemn admiration from a one metre distance delineated on the floor. 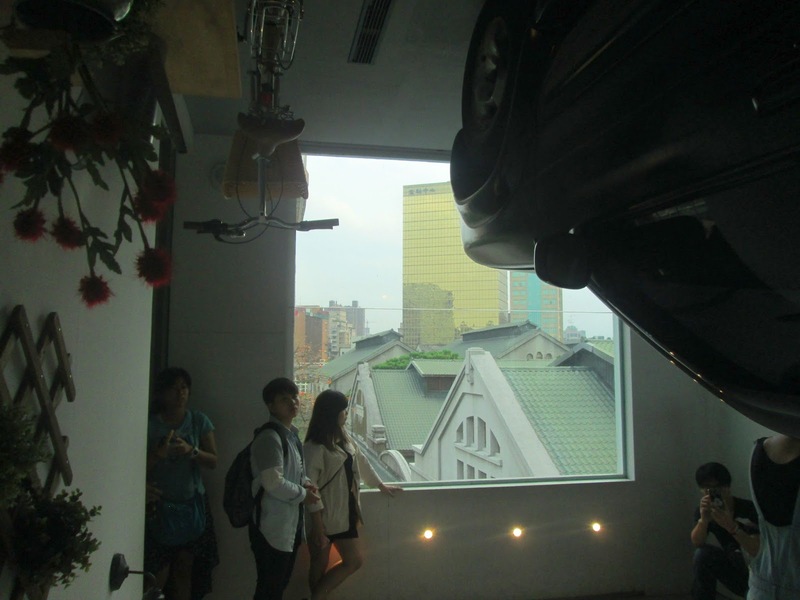 What’s more, even though more traditional forms of art are very different to interactive exhibitions based around construction, it is possible that attractions like Taipei’s Upside-Down House could generate more interest in the use of space in art galleries. Should art exhibitions be spatially neutral, in order to focus attention on the artworks themselves as opposed to their surroundings? Or should galleries be embracing a more modern and creative approach, in which designing a visitor’s path through a gallery could be perceived as the opportunity to provide an experience? Of course, some people – such as curators – would likely argue that most art exhibitions already do this; that even if the ordinary visitor cannot perceive the effort that has gone into positioning the artworks, that effort is still there. Indeed, the use of space, boundaries, and deliberate grouping of works may well affect individuals and their perceptions more than one might realise – and this power of influence to be found in curatorship is not to be underestimated. Not everything needs to be turned on its head in order to be interesting. Regardless of one’s standpoint on contemporary forms of art and exhibition, however, modern constructions such as the Upside-Down House – based around design – do achieve in several keys ways: they intrigue, they delight, and they prompt further thoughts and questions. Granted, one might argue that they merely reinforce stereotypes of self-conscious modern artworks, in which something relatively normal – such as a house practically doubling as an IKEA catalogue – is positioned as extraordinary and fresh. Yet whether or not the house subverts our expectations for art… at least it’s fun. ‘Fun?’ you may be thinking. What does ‘fun’ have to do with art? Considering how labour-intensive the creation of art often is, ‘fun’ may not be the first adjective one attributes to the craft. Art is serious; art has deeper meaning; and, as a result, art critics have a propensity to take it all very seriously. That is understandable, and I have no wish to dilute the quality of their discourse. Nevertheless, perhaps we should give fun more weight when judging art. Just because an exhibition is downright enjoyable shouldn’t automatically render it purely commercial – or, by default, ‘of lesser value’. In conclusion, therefore, why not take a glass, place it upside down, and balance a piece of bread on top of it; such a toast might just be worthy of Taipei’s best-loved Americana home... And even if it isn’t, at least you can glean some idea of what it might be like to live in an upside-down home. Where’s your sense of ever-curiouser curiosity?